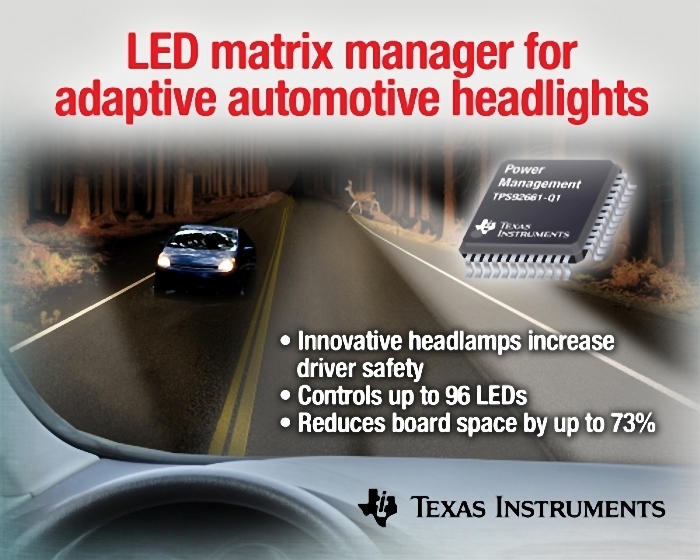 Texas Instruments (TI) has announced the TPS92661-Qi LED Matrix Manager for automotive headlamp applications. The IC integrates 12 MOSFET switches that are used to turn current through or around multiple LED strings to vary beam patterns and intensity in intelligent and adaptive headlamp systems. The most widely known application of an intelligent and adaptive headlamp system is the Audi Matrix unit announced in the year 2013. The system can make a beam to match corners in the roadway and create grades in the beam to ensure that the beams dont blind drivers of oncoming vehicles. Effectively the technology removes the need for a low beam. The system is on production cars in Europe, although for now US standards prevent such applications. Coincidentally or not, TI chose to use the word matrix in the branding of its new IC. The switch array is designed to drive a matrix of LEDs, both turning strings on and off and dimming strings to achieve the adaptive headlamp features. TI says prior to the development of the TPS92661 IC that the switch array would have to be implemented using separate transistors and other components. The company said the IC would reduce the printed circuit board (PCB) size by 73% in an adaptive headlamp controller. The IC can drive as many as 96 individual LEDs broken into 12 strings. Each string can be individually controlled including pulse-width modulation (PWM) dimming with 10-bit precision. The IC also includes fail-safe features such as LED open and short detection and protection. The IC meets the AEC-Q100 Grade 1 specification for automotive-qualified components. It is designed to work with a master microcontroller (MCU) to enable the matrix headlamp functionality. A standard serial communications port can link the matrix IC to MCUs such as the TI C2000 Picolo series that is also AEC-Q100 qualified. TI also proves an evaluation module that R&D teams can use to assess the matrix IC and kick off headlamp projects. The PCB incudes two strings of 12 LEDs, the switch IC, and a C2000 MCU. R&D teams can experiment with dimming and control via included software and develop their own software for new LED-based headlamp designs.